Congratulations to Associate Joseph Merritt for winning a medal in Bocce at the Delaware Special Olympics competition! Joseph Merritt joined the hotel in 2017 as a houseman and has continued to grow in his position on the hotel’s team. Joseph has been active in the programs of the Delaware Special Olympics for the past ten years. He has competed in bowling, softball, volleyball and most recently in bocce. His team, the Newark Dragons recently won the silver medal in bocce competition. 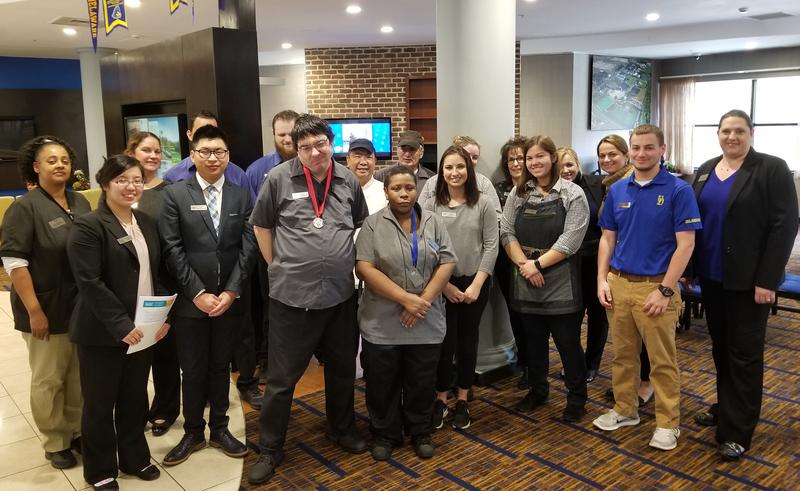 Joseph enjoys working at the hotel and he loves to engage with his friends in the Delaware Special Olympics, where he has made many lasting friendships! Congratulations to Joseph for this great award! This is amazing! Congratulations Joseph!! Great accomplishment, way to go! Way to go, Joseph! Congratulations!! Congratulations Joseph and the entire Newark Dragons team!! Congratulations Joseph! Proud you are part of the Shaner Team! That’s awesome!!! Great job Joseph!!! YOU are amazing. Congratulations to Joseph! Thank you for your hard work and willingness to compete in the Olympics! Thank you for sharing your victory with all of us. Keep up the great work! Congratulations Joseph – way to go! Way to go Joseph!!! Amazing!